Oumou Sy (1952-) was born in Podor, Senegal. An autodidact, she is an internationally renowned and unique creative force who works at the intersection of art, spectacle, and social space. While her imaginative talent has been honed on costume design and manufacture since the early 1980s, her contribution is marked by her collaborations with other African artists in multiple media, including cinema, theater, music, and dance. This theatrical predilection provides a signature to her designs of costumes, haute couture, jewelry, and accessories, while her recent prêt-à-porter lines rely more on local conventions of dress. Sy's work and life raise the arts of cloth, clothing, and body adornment to parity with the fine arts, literature, and cinema, in all of which the Senegalese excel. In the context of Dakar's Francophilic cultural elite, Sy openly and fiercely declares that she chooses not to write or read French. 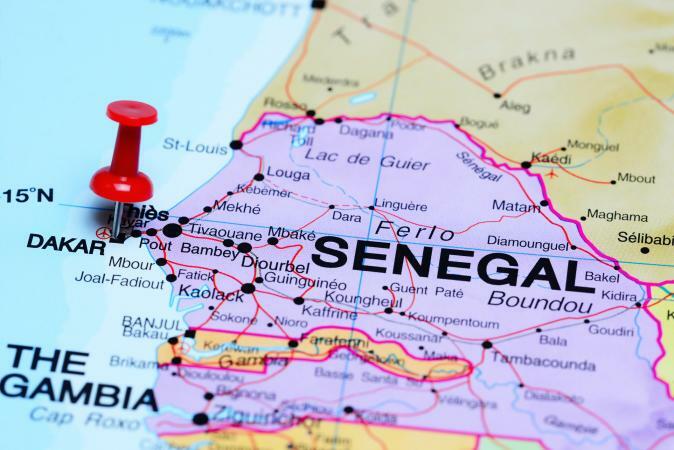 She often reminds listeners that she was raised in a conservative Toucouleur Muslim family in St. Louis, an old trading and colonial city of coastal Senegal. Yet, her articulate spoken voice in French lends an unusual intelligence and authority to her presence and designs. When she puts on her colonial officer's hat and says she is here to conquer, she means it. Her spectacular fashion shows are therefore not only visual and sensory feasts but also a platform for the articulation of an African pride that mines the past and present to produce a future that is in constant dialogue with origins. In effect, she places the cherished, rich Senegambian heritage of artisanship and body adornment into dialogue with the transnational terrain of the contemporary arts. Centuries of transregional trade with Europe and the Middle East and its former status as a French colonial capital have bred a fertile terrain for African and diasporic cultural production in Dakar. Sy is a bold, creative talent and figure for the arts in Dakar who innovates, even more than her creative cohort of African designers, with the materials, forms, and images of both African heritage and modernity. In 1996 Sy and her husband, Michel Mavros, a French filmmaker, founded Metissacana, a Web site, cyber café, and cultural center in downtown Dakar, Senegal. Metissacana is a Bambara French creole word meaning "the mixing of races and cultures (metissage) has arrived." This center spearheaded an emergent infrastructure for African fashion until its closure in 2002. The complex place of gender in Sy's personal and creative narratives involves self-affirmation, transgression, and play. In her own life, Sy speaks of her mother's loyalty when she used profits from weaving commissions to buy her talented teenage daughter a sewing machine. Refusing her family's choice of suitors, Sy rebelled and married a mixed-race, Roman Catholic, Cape Verdean. The marriage ended in divorce, however, and at that point she moved around the country, finally settling in the old African district of colonial Dakar, the Medina, with her children. With the help of Dakar artists like Kalidou Sy, director of the School of Fine Arts, she launched her career in Dakar. Sy conceals her struggle in her playful figures of womanhood, especially perfume woman, cyberwoman, and calabash woman. The costumes worn by these characters present a subversive, mocking femininity in which icons used to polarize Africa and the West as primitive and civilized societies, respectively, are employed as decoration. She said in an interview for France's TV5, "Europeans think Africa is just too much, excess, and that's what calabash woman is about." She also commented in an interview at the Prince Claus Fund award ceremony, "Women of the future will be complete, outfit, accessories, everything" by looking to origins and reconstructing themselves aesthetically. 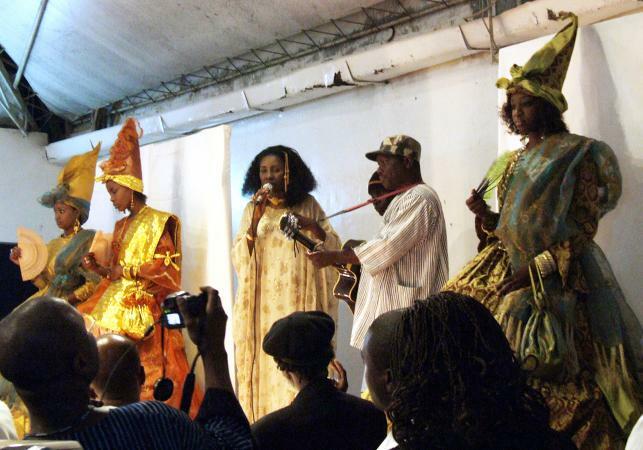 Since 1989 Sy has produced costumes, sets, hair-styles, and makeup for seventeen films, thirteen staged shows, and for musicians such as Baaba Maal and Youssou N'dour. This has brought her prizes from major festival contests and a much broader audience than fashion shows would allow. In the film Hyenas (1992), splendor adorns not royalty but the slaves of an old woman who was cast out from her home village as a young, pregnant girl and comes back to exact revenge. Obsessed with raw power, she uses her slaves to exhibit her beauty, power, and wealth. While Sy's designs for this woman and her entourage create spectacles in some scenes, their neutral tones fuse with the desert scenery to create visual effects of severity. Sy constructs silhouettes of power expressed through volume and density. Refined artisanship provides the foundation of the costume's primary elements of cloth, and careful adornment of both the cloth and the body complete the effect. Inspired by the aristocratic traditions of the Wolof and Toucouleur-the major ethnic groups in Senegal-as well as the Islamic grand boubou, a six meter flowing, embroidered robe (called mbubb in Wolof), her garment forms are characterized by simple stitching of long swathes of cloth that are layered and wrapped. Like many other African designers, she innovates cloth traditions through production technology or the use of "African" cloth (such as cotton prints, woven strips, hand-dyed fabric) in Western styles. She designs tie-dye motifs and weaving for the broadloom, which she uses to weave cloth strips from two-to four-feet long, thereby producing large strips of cloth and reducing the number of seams required to stitch a garment; she also employs expert artisans who often experiment with mixtures of thread or dyes. Sy makes frequent use of embroidery in her costumes and fashion lines. Moreover, in these lines, she gives these traditional garments a Westernized form with belts, sashes, or tailored waistlines that lend contours to the body. African heritage is also the basis for her ornate accessories, jewelry, hairstyles, and makeup. More than a collection based upon a design concept, Sy's costumes present tableaux of historical epochs. For example, the Rois et Reines series (Kings and Queens), dates from the mid-1990s and is inspired by the few historical images available of precolonial Wolof and Toucouleur royal finery. Heavy woven wrappers made of stitched strips of cloth are worn with simple tunic tops of the same cloth. Stoles, heavy amber jewelry, hair jewelry, woolen wigs, and makeup complete the adornment. Dark hues define the natural cloth dyes and the black facial makeup on tattooed lips and lined eyes. Silver and gold decorations on arms and in woolen wigs lend a luxurious feeling to the wearer. Like the most innovative of designers, Sy's usage of primary materials is distinctive, for she does not limit herself to textiles. Her work is deeply modern, ironic, and humorous and uses an excess of materials from all sources. These media range from the urban garbage of perfume bottles to compact discs, calabashes, baskets, and feathers. The cyberwoman wears a taffeta pastel ball gown with CDs adorning the gown's neck and front surface as if embroidering a boubou. Perfume woman is adorned in a slinky, purple silk, wrap skirt and halter top with small perfume bottles-the cheap, sweet kind from Mecca- sewn on as if they were beadwork. Her face is framed with colored glass wands. Calabash woman wears a tight evening dress with a slit right up her leg and gourds springing from her headdress. These designs have often been photographed in the city streets of Dakar amid garbage, wrecked cars, and minivans. These icons of Africa and the West become signposts in the urban landscape for the tragicomedy of modernity, invoking a historical epoch through a series of garments. Sy has won prestigious prizes such as the Prince Claus Fund's 1998 prize, given to African fashion and shared with Alphadi of Niger and Adzedou of Ghana; the same fund gave her an honorary mention as an urban hero for her work with Metissacana (2000). She has also garnered honors for her representation of African fashion at the World Expo of Hanover (2000) and has won the prize of the festival of Wurzburg, Germany (2002); a special prize of the city of Rome (2003); and woman of the millennium (Guinea, 2003). Additionally, her costumes have won awards at the Pan-African Film Festival (1993) and those of Milan (1993) and Johannesburg (1995). She was commissioned by the French government to design costumes for the Dakar celebration of the French revolution's bicentennial (1989). She won the Radio France International Net Africa Prize for founding Metissacana, the first cybercafe in West Africa (2001). Her work has also been exhibited at several museums in Germany, and her couture is sold in boutiques in Paris and New York as well as in Dakar. As an institution builder in culture and the arts, Sy has founded schools of modeling (Macsy) and couture (Leydi) that have produced prizewinning students. Since 1997 she has organized annual international African fashion weeks (SIMOD) that bring together African designers and models for display and networking in a collaborative, noncompetitive environment. In the 1990s she organized the Carnaval of Dakar, a revival of the traditional Fanal parade from her hometown, St. Louis. The event parades models in the costumes and fashions described above through the streets of Dakar's popular neighborhoods. The Metissacana Web site provided links to and information about cultural events and designers as well as an online store for distributing Sy's own clothing and jewelry line. More than this, the site was intended to spearhead national Internet culture in urban and rural Senegal, but it was closed in 2002 due to financial constraints and privatization of national telecommunications systems. La beauté, c'est une chose à l'intérieur. La beauté du corps, ce n'est pas très important. Tous les corps sont beaux. Mais la vraie beauté, la vraie valeur de la beauté, c'est à l'intérieur qu'il faut la chercher. C'est là qu'elle a sa vraie valeur, et c'est là qu'elle est rare. Voilà la réponse à ta question. La beauté à l'intérieur, c'est ce qui devrait être notre but à tous. Oumou Sy and Jean-Michel Bruyere, La Vie a de Longues Jambes [Life has long legs], 1995; translated by Hudita Mustafa. Sy's work of translation across historical epochs, social strata, and cultures make her art, spectacle, and social spaces so appealing to so many. In sum, the broad scope of Sy's creative and institutional interventions in Senegalese culture demonstrates not only her individual genius but also the way that cloth and fashion are embedded in so many aspects of Senegalese society and culture from elite consumption to popular festivity. See also Colonialism and Imperialism; Ethnic Dress; Ethnic Style in Fashion; African Textiles; Tie-Dyeing. There is very little written on Oumou Sy. An Internet search on her name would yield press reports, images, and some interviews from fashion shows in Europe. Two Internet sites with documentation are http://www.metissacana.sn and http://www.perso.wanadoo.fr/afro.art.cybergallery/fashion/prince-claus-fond . 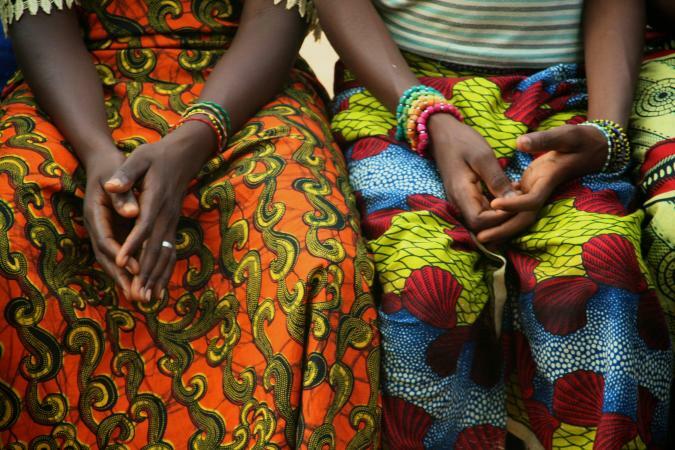 On the Senegalese fashion context generally, see the following sources. Mustafa, Hudita. "The African Place: Oumou Sy, Dakar, Senegal." Archis: A Journal of Architecture, City, Visual Culture 12 (2000): 48-51. --. "Ruins and Spectacles: Fashion and City Life in Contemporary Senegal." Nka: A Journal of Contemporary African Art 15 (2002): 47-53. Plas, Els van der, and Marlous Willemsen, eds. The Art of African Fashion. The Hague, Netherlands: Prince Claus Fund for Culture and Develoment and Africa World Press, 1998. General resource with essays and color images. Revue Noire 27 (March 1998). Special issue on African fashion that reviews important contemporary African designers, including Sy.